The new Sage E-marketing for Sage CRM module is a powerful tool for businesses. Used effectively, it can help businesses to build up a profile of their customer’s preferences and allow them to target their customers more effectively. This is the first in a series of blogs around how to fully leverage the power of Sage E-marketing for Sage CRM. Within Sage CRM go to the Marketing area and click on the new E-marketing Tab. To create an E-marketing Campaign click on the “New E-marketing Campaign” button. You will then be navigated to Step1 of 3 in the E-marketing Campaign creation process. This is where you will enter the Campaign name and any other relevant details such as start date, budget etc. Fill in all of the appropriate details and click “Continue”. You will then be navigated to Step 2. On this screen you can enter the details of the Campaign Wave. A Wave is a method of grouping marketing activities together within a Campaign. For more information on Waves see the Online Help. Fill in all of the necessary Details and click “Continue”. You will now be navigated to the final step in the E-marketing Campaign creation process. This is, as they say; “where the magic happens”. This is where you create your E-marketing Email. 1. Subject Field: This is the Subject Field of your E-marketing email. 3. Group (recipients): This is where you select your recipient group. This list will contain all of the groups within CRM that you have the security rights to view. 4. Get e-mail address from: This will display a list of all e-mail type fields contained within your selected group. This allows you to select the appropriate recipient e-mail address from your group. For example, you might have a company group but instead of sending the e-mail to info@companyx.com you want to send the e-mail to the lead person in each company. In this case you simply select the lead person email address field. 5. 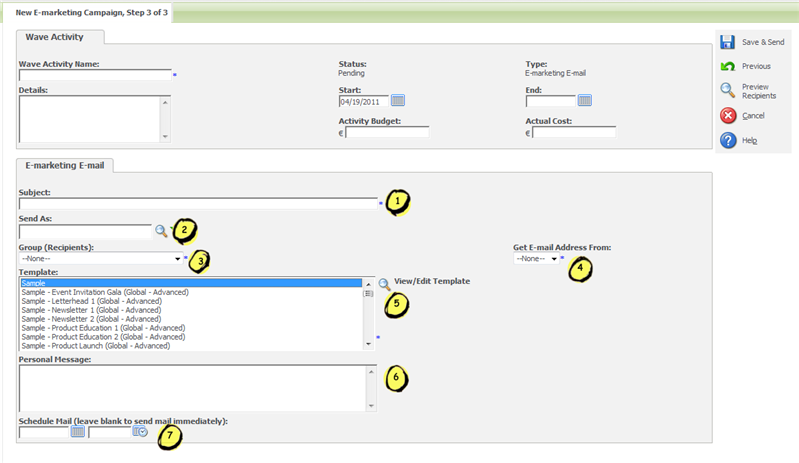 Template: This is a list of all templates associated with your Sage E-marketing for Sage CRM account. There are over 90 templates provided with the Sage E-marketing for Sage CRM account. You can also create your own templates from scratch using the template editor or upload your own existing templates. 6. Personal Message: This fields allows you to enter a personal message that will be placed into your E-marketing email (provided the template is set up correctly). This means that you can have one template for your entire campaign that can be personalised for each activity. 7. Schedule Mail: this allows you to schedule when the mail will be sent. If you leave this field blank the e-mail will be send straight away. Now simply click on send and hey presto... no more blindfold marketing! All you need to do now is sit back and wait for the results of your E-marketing E-mail to automatically synchronise back into Sage CRM. Thanks to Sage E-marketing for Sage CRM you are now on your way to knowing and understanding your customers better!